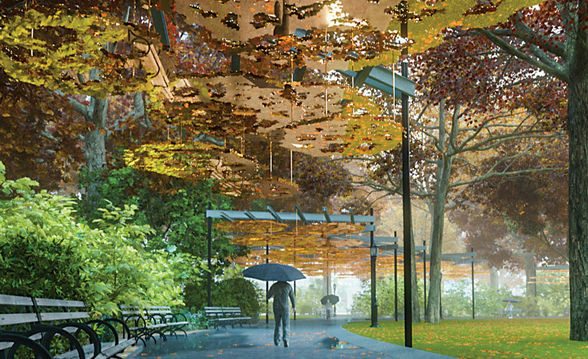 An image of Teresita Fernández´s “Fata Morgana” at Madison Square Park, New York City. It was perhaps fitting that an event titled “Artists As Citizens” took place on the same evening of the final presidential debate of this election season. But the conversation, held Wednesday at the headquarters of the National YoungArts Foundation in Miami as part of its Salon Series, was not about partisan politics but art, activism and social practice, beauty and community engagement. In fact, the talk, featuring artists Teresita Fernández, Mel Chin and Chat Travieso, was “the beginning of a dialogue here in Miami about social practice and how artists want to engage in this kind of work that we need to model better, “ said host Carolina García Jayaram, president and CEO of the National YoungArts Foundation, in her introduction. By the end of evening, the extraordinary work and the broad range of approaches discussed spoke of the importance and enormous potential of social practice.